regulation which was governing them as an act. So the need for the central banking system in India arose in 1773. However, it was the Hilton Young committee in 1926 recommended the establishment of a central bank in India. Therefore, it took 7 years to pass the RBI act 1934 as a shareholders banks. 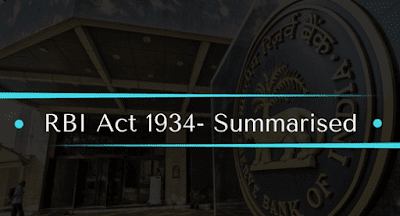 Finally, a number of banking companies were registered under the companies’ act 1956 and The RBI act 1934 for the purpose of protecting interests of the depositors’, ensuring control over the credit, develop banking on good lines and avoiding bank failures. A governor and not more than four deputy governors appointed by the central government. Four directors nominated by the central government, one from each of the local boards. One government official nominated by the central government. The RBI has regularized the issue of Bank notes (currency). The reserve bank is the banker’s bank. The reserve bank is acting as a liaison between the government and commercial banks, financial corporations and small savings boards. The RBI had played an important role in the development of institutional machinery of industrial finance, agricultural credit and commercial banking. The reserve bank has ensured monetary stability in the country. Bank rate – a rate at which RBI lends money to various institutions. The capital of the RBI should be 5 Crore. It exempts bank notes from stamp duty. The special one – rupee note should be deemed to be included in the expression “Rupee Coin”. No person in India other than RBI had the authority to draw, accept, make or issue bills of exchange, hundis, promissory notes, or engagement for the payment of money payable to bearer on demand or take up any sums of money on the bills, hundis or notes payable to bearer on demand of any such person. If the average daily balance was maintained by a scheduled bank at RBI during any week was below than the prescribed limit, such scheduled bank should be liable to pay 3 % above the bank rate on the amount by which such balance with the RBI falls short of the prescribed limit. If it continuous they should pay 5 % above the bank rate. The profit of the bank should be paid to the central government. From the profit, the RBI should maintain reserve funds and also used to settle debts. And also the reserve bank should maintain special fund called National Agricultural Credit Fund. Conduct of the business of central boards and the procedure for its meetings. Conduct of business of local boards. The delegation of powers and functions to local boards and of central boards to Deputy Governors, directors, officers of the banks. Formation of the committees of central boards and delegation of powers to that committees. Execution of contracts binding on the bank. Use of common seal of the bank. Maintenance of accounts and preparation of balance sheets of the banks. Remuneration paid to the employees. The returns filed by the scheduled bank with the banks. Conduct and management of the clearing houses for the scheduled bank. Refund of currency notes which was stolen, lost, mutilated or imperfect. The governors and deputy governors were appointed for such term, not exceeding five years. They can be reappointed for the further term. They are the full – time officers of the bank which would be permitted to undertake part-time as honorary work if the central government was given permitted it. There is no fixed term for government officials. As the part of ten directors who were nominated by local boards had a term of office only up to their membership in the local boards. The remaining ten directors were appointed for 4 years. The central board had delegated some of his powers and obligations to a committee called as committees of central board consisted of the governor, deputy governor and such other members might be present at the place meetings. Every meeting of the committee was held for a week, particularly on Wednesday. These committees contain two – subcommittees. For each of the four regional areas of the country such as Delhi, Mumbai, Chennai and Kolkata consisted of local boards. Local boards consisted of five members for a term of four years. Regulation of monetary growth and maintenance of price stability. Ensuring adequate expansion of credit. Encourage flow of credit into priority and neglected sectors. Strengthening of the banking system of the country. Bank Rate Policy: The bank rate is an official interest rate at which RBI rediscounts bills held by commercial banks. For controlling credit, inflation, and money supply RBI will increase the bank rate. Current bank rate – 6%. Open Market Operation: OMO aims to direct sales and purchase of securities and bills in the open market by RBI which aims to control credit. Cash Reserve Ratio: CRR refers to that amount of deposits in the commercial bank which it has to keep with RBI as a reserve. Current CRR – 6%. Statutory Liquidity Ratio: SLR refers to that portion of deposits kept itself as liquid assets. Current SLR – 25%.